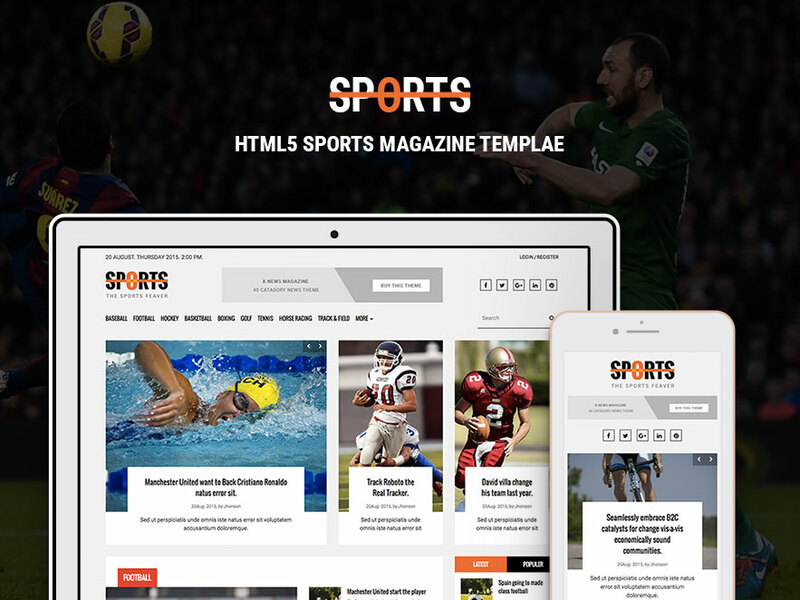 Sports News Portal is simple, clean, lightweight, beautiful, elegant and one stop responsive HTML magazine template for sports and games website. It’s amazing and fantastic, ships with UI elements and feature packed which are easy to use and customize. Sports news portal is responsive efficiently resized and keep site appearance aesthetic thought the entire viewing devices like iPhone, iPad, iMac, MacBook Pro, Windows phone, Blackberry Phone, Symbian Phone and other high-resolution devices. The Bootstrap HTML magazine template looks incredible, streamlined and straightforward, keep your valuable content stunning throughout the modern browsers as well. It’s compatible Google Chrome, Mozilla Firefox, Internet Explorer, Opera, Microsoft Edge and more. The Best Sports Magazine website template is highly professional and powerful can be used as various sports website. The simple template helps you create magazine website for Football, Hockey, Basketball, Boxing, Golf, Tennis, Horse Racing, Cricket and more. 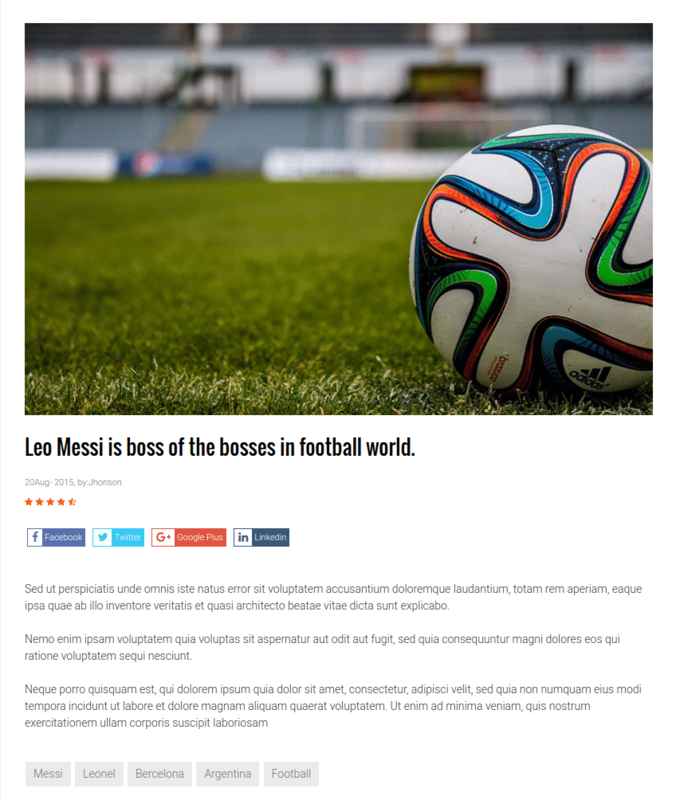 The Sports magazine Bootstrap template is available for free download. It ships with all open source and attribution free resources. So, you can include this template in your project without any hard and fast rule, but you have to provide copyright linkback. It helps others to reach and download for their personal and commercial projects as well. 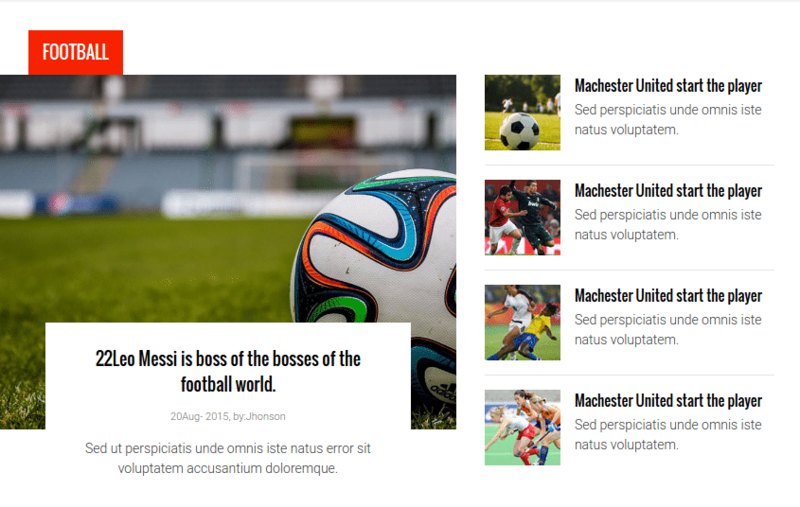 Here are the key features of Sports news portal theme. Magazines are frequently read throughout the various small and handheld devices. Consequently, It gets the maximum level of traffic from unmatched mobile devices. So, We have assembled it with top-notch technologies. So, it can tailor and accordingly capable of resizing based on device’s screen sizes. It means whatever devices take visitors to your website, everywhere your website will be visible with customized and splendid appearance. Loading speed matters whatever website you own. When it comes to sports magazine website portal, lightning fast loading speed is mandatory. As it’s mostly viewed from mobile devices, it should quickly be visible mobile devices in a blink of eyes. Otherwise, you will lose visitors and have your bounce rate high. So, we released responsive sports news portal optimizing codebase so that It helps unnecessary bandwidth consumption for sloppy codes. Every sports and gaming news has a certain life span. It should be reached to its readers quickly. So, Sports news portal has crafted with semantic HTML codebase which helps search engines to index your content and give them quick rank in the search engine result page. When it comes to supporting browsers, developers have to do various separate code structure and tricky to select HTML and CSS elements. Otherwise, it works fine in some search engines, get distorted others. So, Sports magazine bootstrap html5 template is crafted with great care which perfectly get adapted inside throughout the Google Chrome, Mozilla Firefox, Internet Explorer, Microsoft Edge and more. As sports is one of the best free Bootstrap HTML5 magazine website template, it’s glutted with extraordinary features that help you to run your sports magazine site successfully. The industry oriented features are as follow. 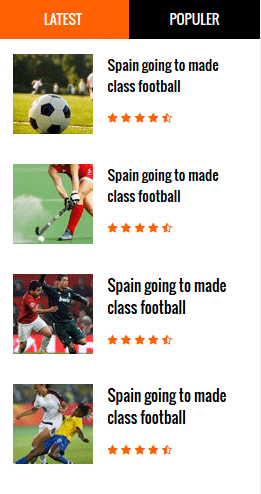 To make sports news separated showing precedence one over another, it needs to highlight some categories. In Sports news portals bootstrap HTML5 template, we included a couple of carousels to demonstrate category news sliders which convince readers individually. High flexibility and endless customizability is another unbeaten feature of this theme. As it’s crafted with HTML5, CSS3, and Bootstrap3, having minimal knowledge of coding you can tailor it with any of your news portal project. 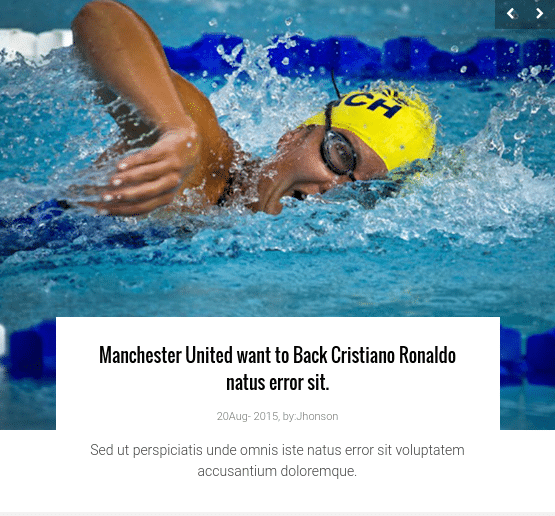 Sports News Portal responsive Bootstrap html5 template is also equipped with intuitive animations. 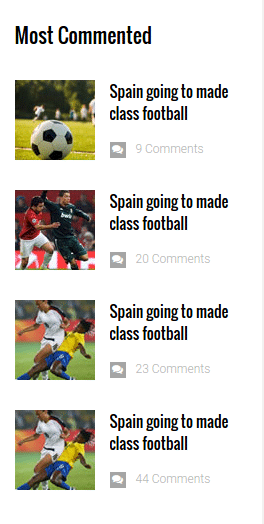 Whenever you hover over sports news title, you get colorful interaction. If you are looking for such an sports newspaper website template with amazing iconography, you can give this bootstrap template a go. It includes FontAwesome icon to show search icons, social sharing icons, rating icons and so on. Sports news portal comes saturated stylish and clearly readable typography which helps your readers to easily and smoothly reads your sport magazine contents. To give you access to ultimate access to customize and add personalized typography, it comes packed with Google Fonts. By default, it includes Oswald and Roboto Google fonts, but you can add your desired one with ease. We crafted bootstrap template with great care, and provides everything so that you can easily adapt our work with your personal and commercial projects. On top of that, If you need any help, drop a line to us. You’ll find us there to help you all the time.